Last weekend we had a hoof trimming day, a wee bit overdue and prompted by an upcoming vet appointment, which is just terrible, I know. Kind of like flossing before you go to the dentist. 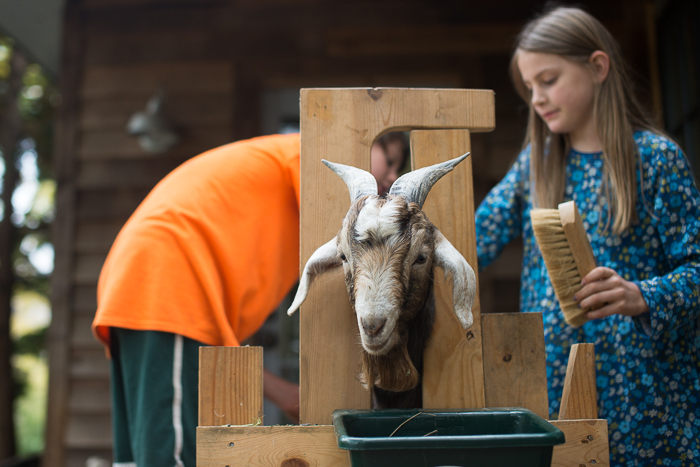 But hoof trimming is just not fun, especially with our adult goats. I’m quite sure that part of the problem is that we are still very new at this. Of course, if we move to the every two week schedule that I think they need, surely the girls will become more cooperative. We give them a mixture of sunflower seeds and alfalfa pellets for distraction. Though they aren’t supposed to have it until they are on the stand. Clearly, we need help in the preparation area. 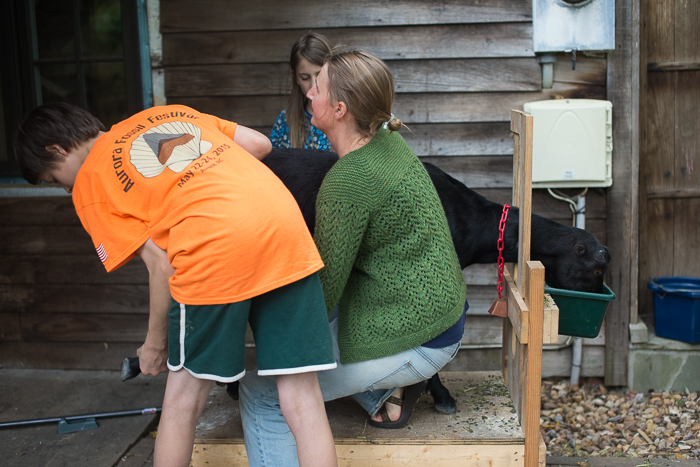 The little ones are learning all about hoof trimming as well. They practice on each other. 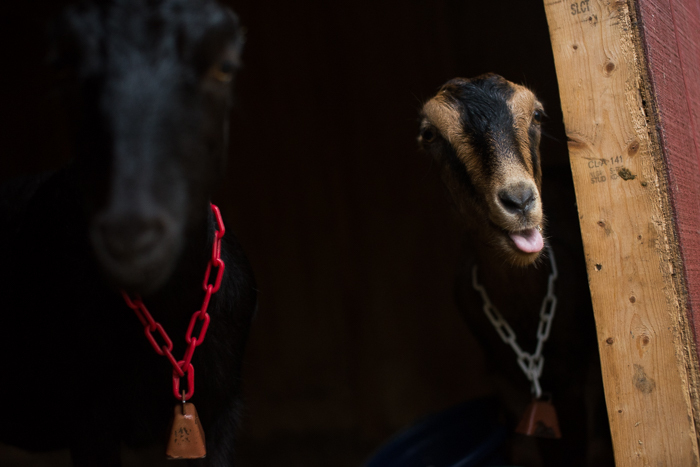 The baby boy goats (well, they are about seven months old now!) do behave themselves while they are trimmed. They are our perfect little babies. Little John ended up escaping his vet appointment this week, after all. They rescheduled for next week because of rain. The poor guy hasn’t been wethered yet due to an un-descended testicle (sorry if that’s tmi!) None of us are looking forward to his surgery, which will probably prove to be pretty invasive in order to find the missing, ummmm… part. He has gotten really stinky and is engaging in un gentleman-like behavior, so for that reason alone we will be relieved when all is said and done. Despite the fact that the little boys are smaller and possibly cuter, I still prefer Agnes and Greta. Naughty, stubborn animals amuse me. Those that cause the most trouble are typically my favorites. 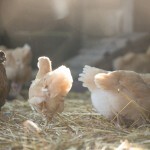 I took these photos from up in the loft where I was filling the girls’ feed buckets with their afternoon snack. 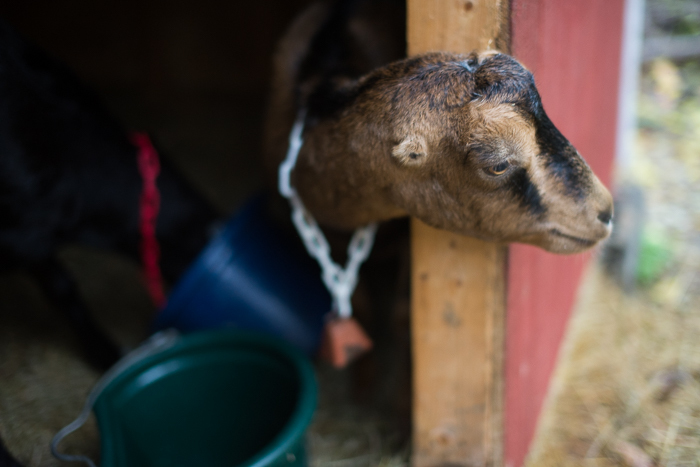 Agnes is always very focused on food, and though it was raining, she was jumping up on the side of the barn, anxious for me to hurry up (and stop taking her picture). 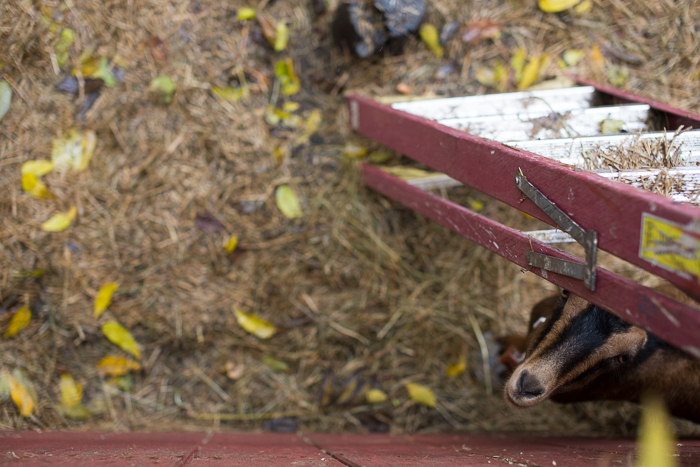 Greta, who usually joins her in this, didn’t like the rain, so she was hiding under the ladder, trying not to get wet! I’ll let you know how the vet appointment goes. Our first farm call! My brother used to keep some goats. A Christmas present from me many years ago! haha! goats are so funny! By the way, I just LOVE your green sweater!! I’m attempting to knit myself a similar one, although I’m a tiny bit afraid I did not get enough skeins. . . we shall see, hopefully I can find the same color if I don’t have enough, otherwise, it may be a short sleeve sweater, ha! 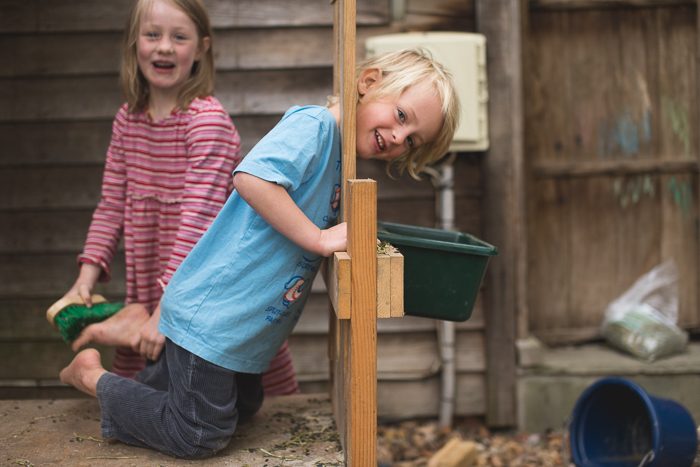 That last photo pretty much sums up the rest of the blog post really – so cheeky! I would love a goat! They are so cute and pesky! goodness me! 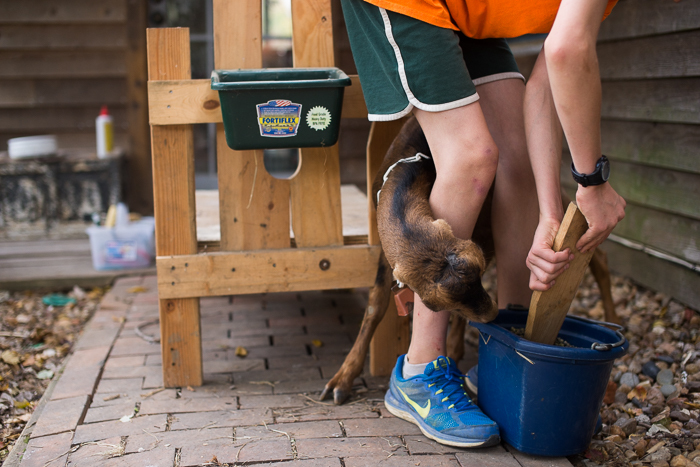 I am amazed at what goes on in taking care of goats 🙂 I smiled that you like the naughty ones, so maybe you are cut out for all that teenage angst (ha ha ah)! I hope his “stuff” descends so that life can be better for him and your farmette. LOVE those last two pics, Ginny! The first like the girls were posing for you, heads together; the second in all their naughtiness. Hilarious! Brilliant post and pics! But I have major sweater envy! Please could you tell me which pattern it’s from? Thank you. I am impressed/horrified to see you with a goat on your lap, wearing that beautiful sweater! You look gorgeous. I live on a dairy farm, and it’s depressing what the cows have done to some of my lovely handmade clothes. Most of mine are locked up in the closet, where I enjoy looking at them from time to time. 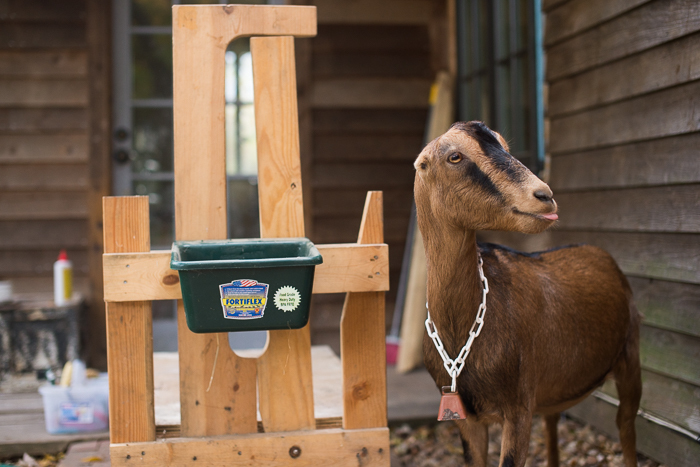 I guess goats have neater poop than cows, but still! Ginny, your stories are hysterical as are the kids! 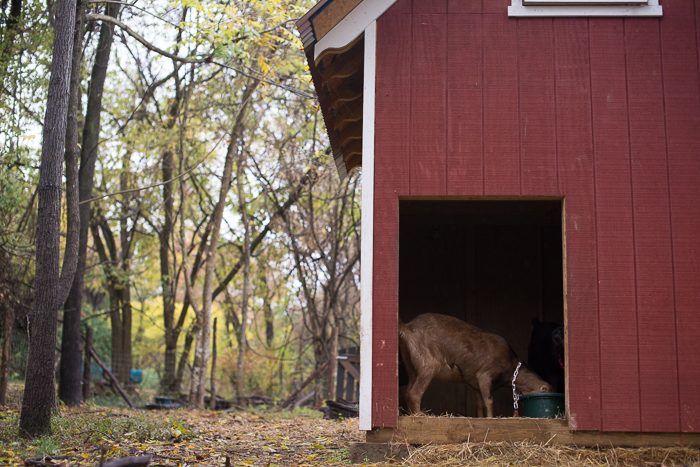 Our boys love to get in to the goat house and pretend that they are naughtly little gotats as well. It´s wonderful to see you so good humoured on hoof trimming day. I can´t say that there are so many smiles around here on trimming day. Keep up the good work. Ginny, how do you store all your photos? Love these photos. Looks like it is a family affair and everyone chips in to help. Ah I remember hoof trimming, my Dad was pretty skilled and confident, looking back. Your picture bring back many memories. But trying to work out what breed of goats you have, I would have though Anglo Nubians but can’t work out the small ears on two of them!? become a vet…you never know! Looks like Greta is fond of sticking her tongue out. I wish you well with the hoof trimmings. 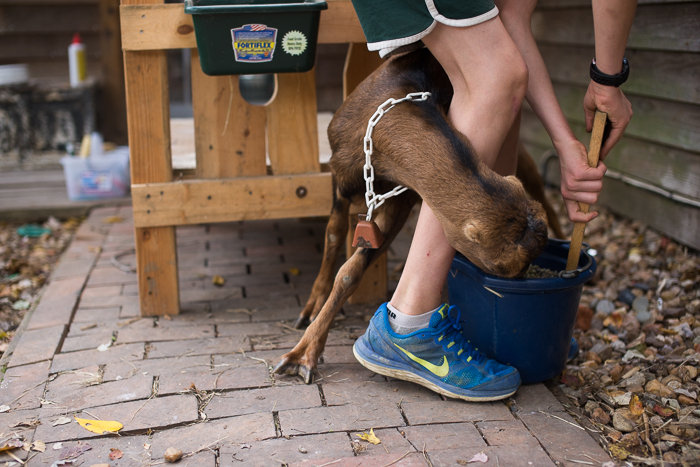 My husband trims our goats’ hooves; he’s the only one strong enough to deal with them. 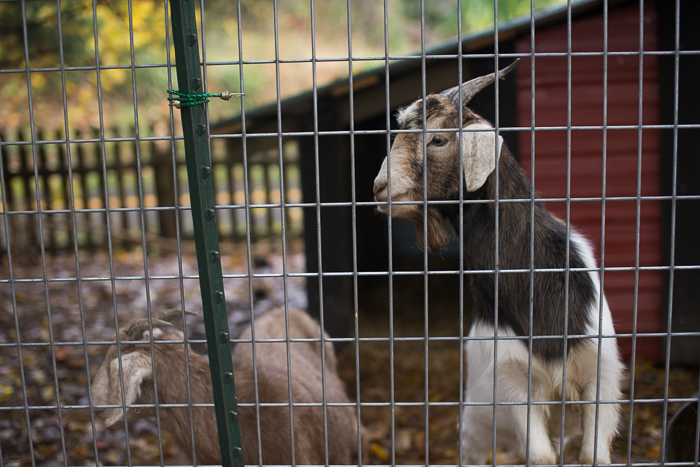 The goats are pretty good as long as he doesn’t take too long. I wonder if Heidi’s grandfather or Peter had to trim the goats’ hooves? Maybe in goats’ natural habitat climbing around rocks, they hooves wear down naturally. 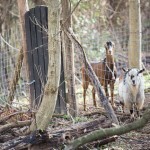 We don;t live in an Alpine setting, but we have noticed that now that our goats are free-ranging in our neighbor’s 10 acre field, their hooves don’t need trimming as frequently. 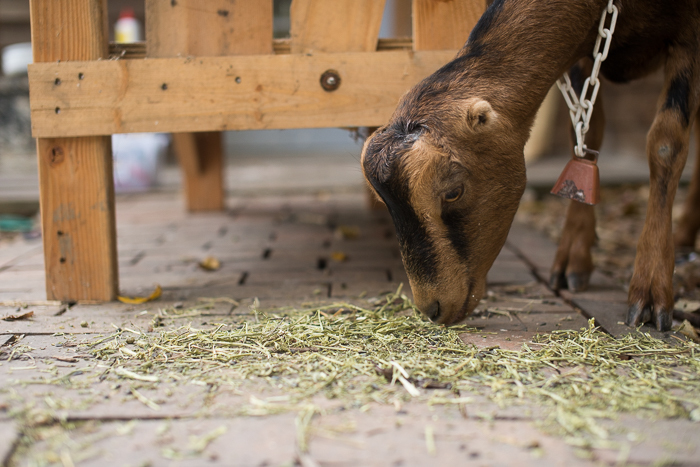 Just love your stories about the goats! Like you I love the naughty animals the most. We had a goat when I was a child, named Marcel. 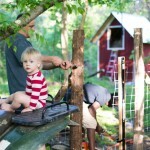 He loved climbing on his shed and could even climb in trees! Your stubborn goats remind me of him, so thanks for nice memories! 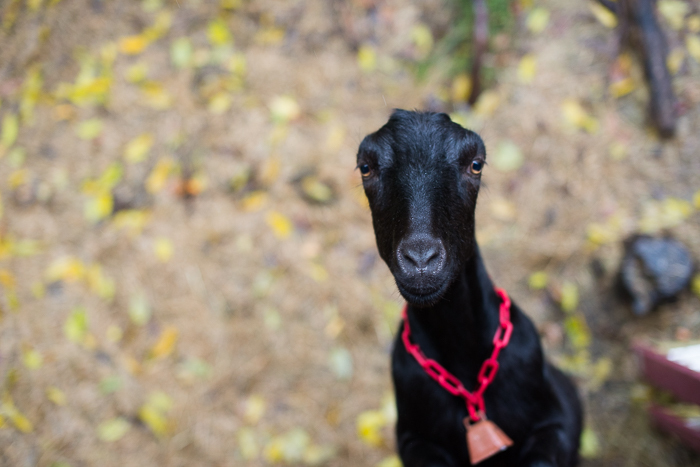 Ginny, your goats are lovely, but where are their ears!? I did chuckle at the goat stand. If only they made them for children eh?! I think La Mancha goats don’t have protruding ears. 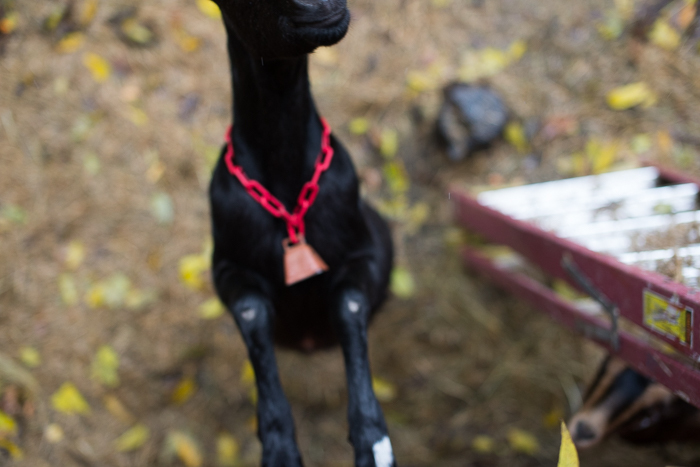 I personally like the floppy ears of Nubians. Ginny, I don’t know how you manage to take such amazing photos of goats!!!! Even my docile sheep are difficult to photograph! 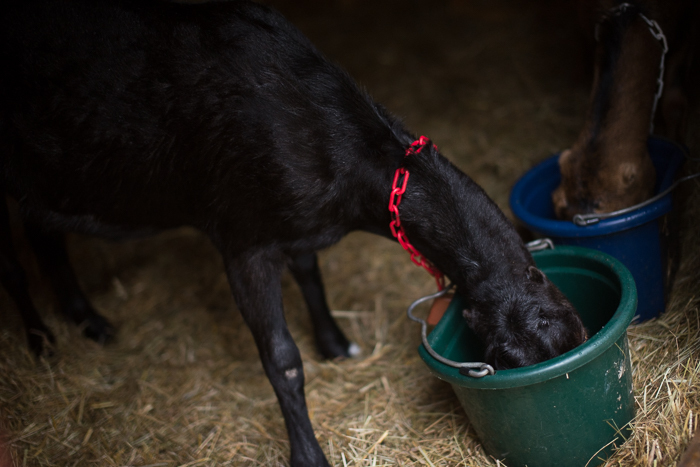 Your adventures in animal husbandry always bring a smile to my face as I relate so very well…we are just over a year into our journey of raising sheep, and we our goats arrived this past spring. I wouldn’t trade a moment of it…honestly. I am hoping to buy some coveralls for my husband and me for Christmas…too much lanolin on my clothes and especially after hoof trimming days…ick! Everything I own has become farm-worthy and I don’t have any nice clothes for town days anymore. 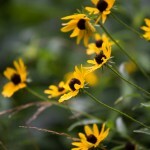 Wishing you a wonderful weekend! Oh, and I showed my little girl your goat pictures here and the first thing she said was, “Where are their ears?” I didn’t even notice! 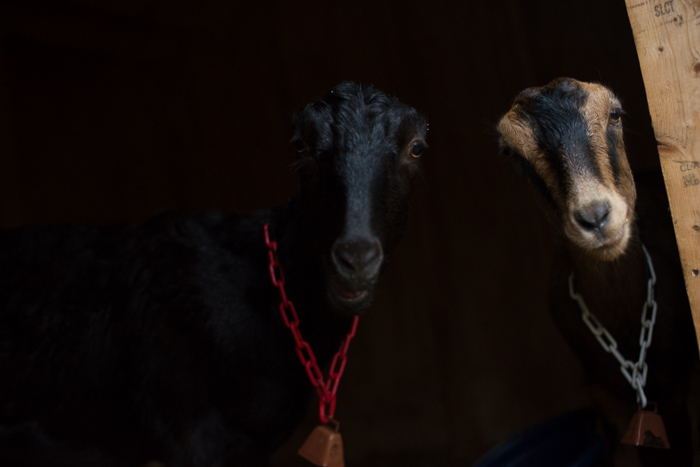 Two of your goats have very different ears than the Nunbians that we have (and your other two). Funny! 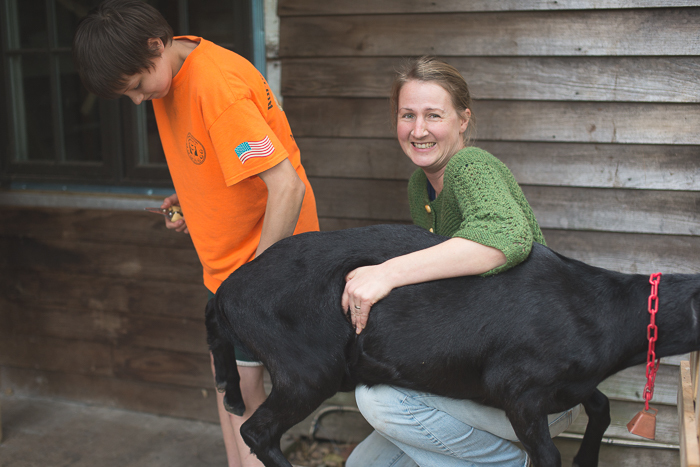 She says she wishes she could play with all of your kids…both humans and goats! I enjoy all of your animal escapades. 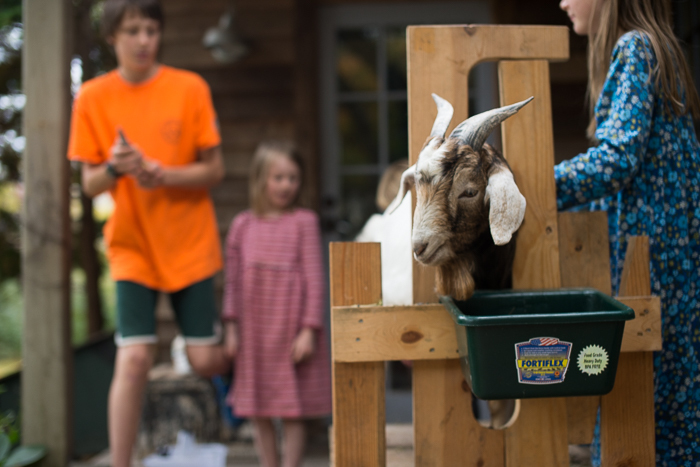 I know nothing about goats, but it is fun to learn from your experiences. Mostly, I wanted to thank you for the beautiful yarn I received in my mailbox yesterday! Thank you! Wow! Goat work looks like HARD work! Way to go! Thank you for updating us on the goats. 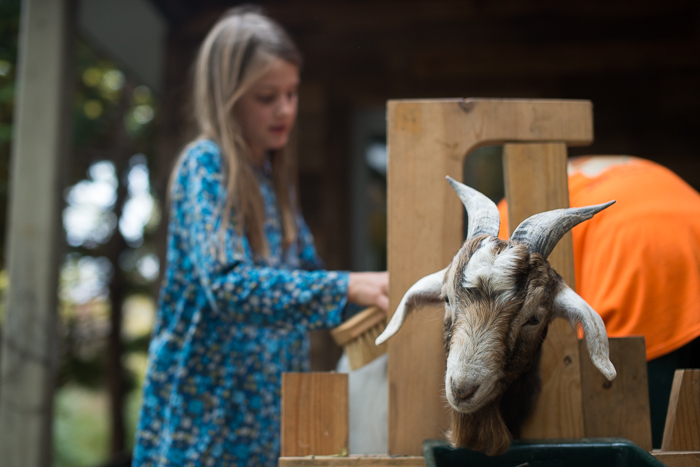 I kind of fantasize about having goats some day- my kids love goat milk and cheese (they are lactose intolerant), but it’s so expensive! I also romanticize hearding animals after reading The Shepherd’s Life and Goat Song. Oh, and our family has been listening to the James Harriot books, so your anatomy talk and feelings about the upcoming vet visit aren’t so shocking! Having a side in our stantion makes that job easier. You can push them up against the side and only have them moving or kicking one direction instead of freely. Just a thought! Good advice! Our stanchion is pushed up against a wall. It does aid in keep the goats under control when milking and trimming. Maybe it keeps them calmer, not having to watch both sides for activity?